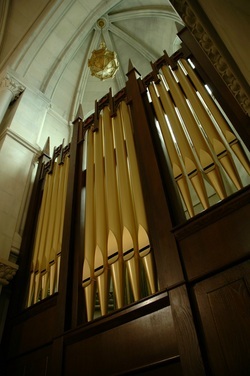 Classic Organs: These pages feature many of our home and church installations of Rodgers Organs in Indiana and Kentucky. Classic Organs guiding statement, Inspiring People to Worship, indicates our strong desire to work specifically with houses of worship. We endeavor to install digital and hybrid instruments with the same level of care and artistic voicing one would expect from a fine pipe organ builder. Rodgers Organs have been the perfect product complement to that end. They have always provided us with instruments having the finest voicing capability and ease of interface to either new or existing pipes. Pictured: The Gothic Chapel at Crown Hill Cemetery. Classic Organs beautifully envisioned Gothic style hybrid installation helped the chapel win awards for historic renovation. This new organ convincingly looks as if it was built with the chapel in 1875.